Richland Hills and North Richland Hills TX can now have quality tree trimming and removal at the lowest prices in DFW. 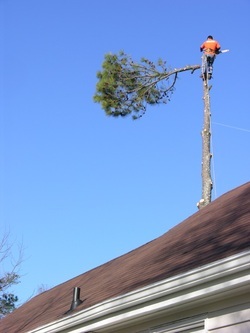 Justin Time Tree Service offers free quotes and bids on every project we undertake. We will come to your home for a free, no hassle, no pressure consultation. We look forward to serving you and being your go-to tree service for years to come. So call us today! Popular trees in NRH: The bald cyprus. The bald cyprus grows naturally in lowlands around water, but it will adapt to urban settings. The lacy, upright tree looks somewhat like a pine, but is deciduous, with reddish brown fall color. It looks great used singularly or in masses. Bal cypress has few insect or disease problems, which make them popular in North Richland Hills and North Texas in general. Proper irrigation and care is required unless planted in a low-lying area. The Dallas Arts District is a popular place to view these beauties. Note: Always specify and purchase such trees by height. Trees often grow taller than you think, which is another consideration. Whether you should pick a tree that grows at a relatively fast rate or at a slow on depends on a number of factors. The slow growers, because they must be cared for longer in a nursery before they reach salable size, are more expensive than fast growers and, once planted in a home landscape, take longer to reach maturity. These are the trees we are fortunate to inherit when buying an older house, but they can also be planted as a long-range investment and as a heritage for children. Most slow-growing trees are long lived as well as handsome, and their dense, fibrous wood makes them resistant to breakage in wind and ice storms.